We are reckoned among the leading manufacturer and supplier of CZ and KundanDesigner Imitation Jewellery and other associated products. 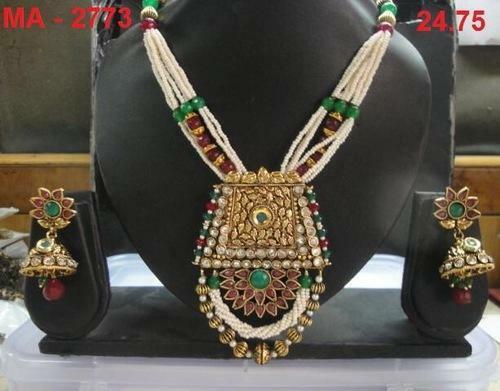 Wide array of products offered by us are Our exclusive range of products includes Solitaire Finger Ring, Eternity Finger Ring, Wedding Finger Rings, Fashion Earrings, Artificial Diamond Studded Earrings, Fancy Long Earrings, Fancy Pendant Set, Designer Pendants, Fashion Pendants, Designer Bangles, Cluster Pendant Set, Color Stone Bracelets, Trendy Chains, Designer Mangalsutra, Antique Necklace Set etc. Our firm was set up with an endeavor to serve the clients in greatest probable manner by offering high quality products to them at cost-effective prices. Our products are not only liked and chosen in national market but clients from global pitch too refer them, which has effect in recurring orders. Our team offers products as per the clients necessity and that too in the preferred time.